The purpose of this guide is to determine the earliest known Human innovation of various technologies seen in Star Trek. Quotes and information from all TV series and movies is used, with Memory Alpha and Ex Astris Scientia as sources. No information found only in books, scripts or online is included on this list regardless of whether it may be considered canon or not. 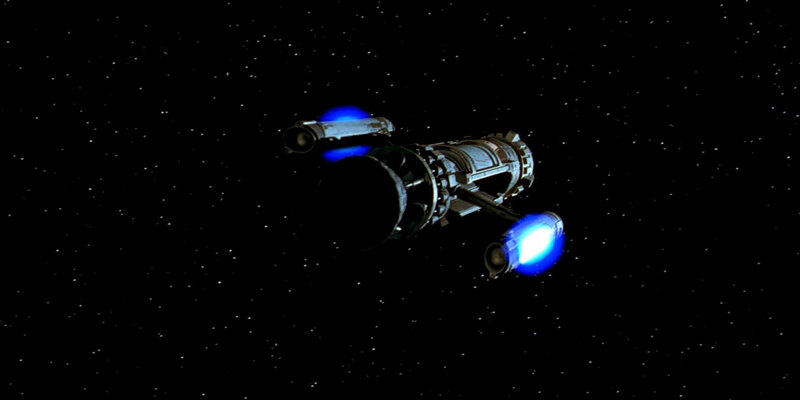 Impulse engines in ENT: "Broken Bow"
Impulse drive is in use on Enterprise NX-01 in 2151 (ENT: "Broken Bow"). The SS Valiant had impulse and presumably used it to get to the Galactic Barrier. 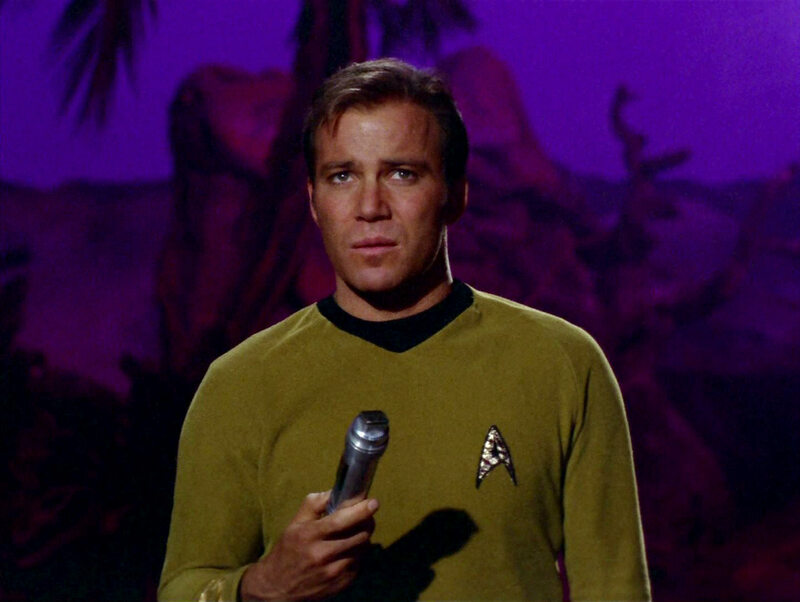 Captain Kirk announces that they picked up a marker launched from the SS Valiant over 200 years ago, this was in 2265 (TOS: "Where No Man Has Gone Before"). It's not seen in 2063 on the Phoenix ("Star Trek: First Contact"). Geordi LaForge says that the principle of impulse drive hasn't changed in 200 years (TNG: "Relics"). Warp flight of the Phoenix in "Star Trek: First Contact"
Zefram Cochrane makes the first human warp flight on April 5th, 2063 ("Star Trek: First Contact"). In 2254 warp drive is not used on the Enterprise, but rather something called hyper drive. This was never explained on screen, but the Enterprise uses warp drive on all later episodes (TOS: "The Cage"). 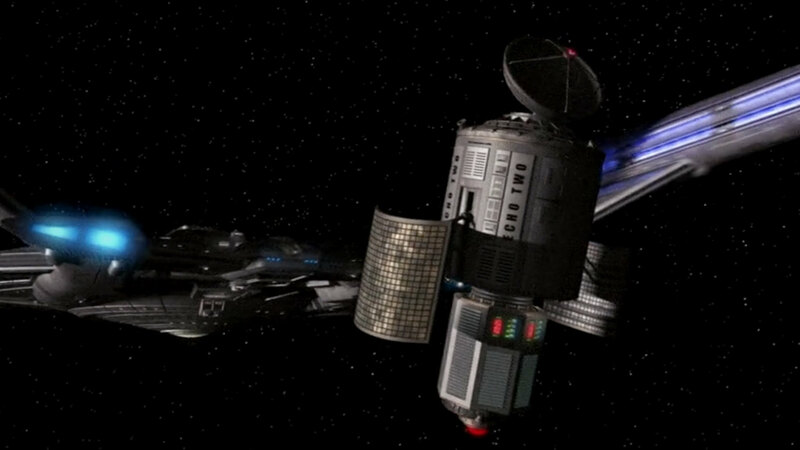 The previously missing Bonaventure seen in 2269 is said to be the first ship with warp drive installed (TAS: "The Time Trap"). In the 2270s, the long-range courier Surak transports Commander Spock from Vulcan to rendezvous with the USS Enterprise, which is en route to intercept V'ger and in the same year Laika, another warp-capable shuttle, tries to make contact with the Epsilon IX array ("Star Trek: The Motion Picture"). At least some of the shuttles of the Enterprise-D (since 2264) are warp-capable (TNG: "Samaritan Snare" etc.). In 2372, Tom Paris of the USS Voyager manages to break the transwarp threshold in the shuttlecraft Cochrane, after discovering a new form of dilithium. Mr. Paris is the first person in Starfleet to cross the transwarp threshold, and turn into an amphibian (VOY: "Threshold"). No deflector dish on the Miranda class in "Star Trek: The Wrath of Khan"
NX Alpha, Beta and Delta (2144), the prototypes of the NX Program, don't have a deflector dish (ENT: "First Flight"). This technology is not seen on the Phoenix in 2063 either ("Star Trek: First Contact"). 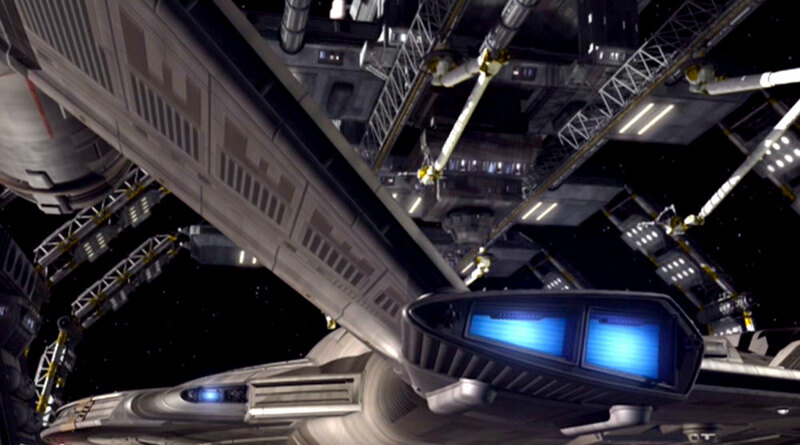 The Enterprise NX-01 uses a deflector dish in 2151 (ENT: "Broken Bow"). 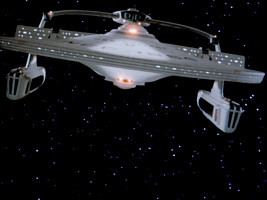 Some starships of the 23rd century, such as the Miranda class or the Constellation class, don't seem to have a deflector dish ("Star Trek: The Wrath of Khan", TNG: "The Battle"). In 2371, when a 1936 Ford truck is brought aboard USS Voyager, Harry Kim mistakes it for an early hovercar. However, Tom Paris states that particular automobile was about a century too early for that to be the case (VOY: "The 37's"). 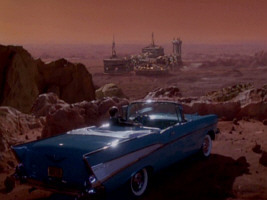 In 2269, when Harry Mudd is attempting to sell his love potion to the miners on Motherlode, a number of hovercars and trucks are seen in the parking lot (TAS: "Mudd's Passion"). Many hovercars can be seen on Earth in 2259 of the alternate timeline ("Star Trek Into Darkness"). 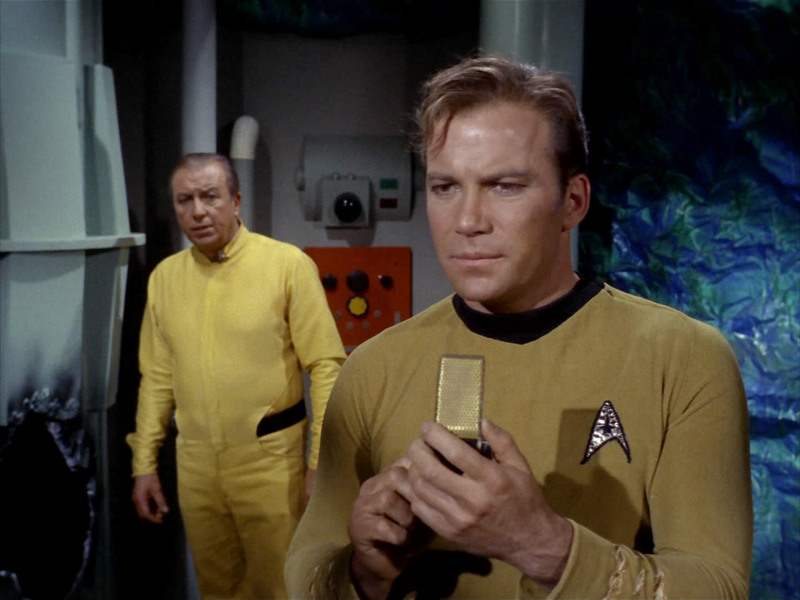 Communicator in TOS: "The Devil in the Dark"
All Star Trek series feature this technology. In the real world, Dr. Martin Cooper, the inventor of the modern mobile phone, credits the Star Trek communicator as being his inspiration for coming up with the invention in the 1970s. In Starfleet, the commbadge replaced standalone communicators in the early 24th century (TNG: "Family"). The Starfleet insignia pin first used in "Star Trek: The Wrath of Khan" later became a combadge, as Lieutenant Richard Castillo can be seen pressing his and speaking into it in TNG: "Yesterday's Enterprise". Subspace amplifier in ENT: "Silent Enemy"
Earth has developed subspace communication as early as 2151. During this time, however, subspace amplifiers are required in order to maintain contact between Earth and Starfleet vessels over long distances (ENT: "Fortunate Son", "Silent Enemy") . The treaty following the Earth-Romulan War was established entirely by subspace radio. No visual contact between the Humans, the Romulans, or their allies was ever established (TOS: "Balance of Terror"). Subspace communication was not available to all Earth ships during this period. The Horizon was not able to communicate via subspace when the ship made contact with Sigma Iotia II in 2168. Thus, their report was not received by Starfleet Command until a hundred years later (TOS: "A Piece of the Action"). 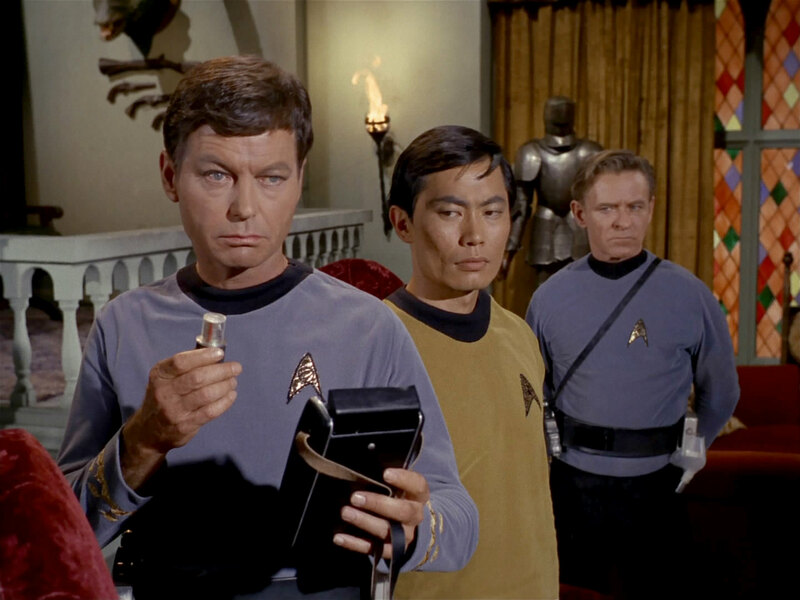 Tricorder in TOS: "The Squire of Gothos"
The first "real world" tricorder was developed by Vital Technologies Corporation in 1996. The scanner was called the TR-107 Mark 1. It could scan EM radiation, temperature, and barometric pressure. The TR-107 is properly referred to as a true "tricorder" due to a clause in Gene Roddenberry's contracts with Desilu/Paramount dating back to the time of The Original Series. The clause specified that if any company could find a way to make one of the fictional devices actually work, then they would have the right to use the name. These devices were already in use during the 2150s (ENT: "Dead Stop"). At some point between 2144 and 2154, Arik Soong was able to open all the locks in the San Francisco prison he was being held at using just a PADD (ENT: "Borderland"). 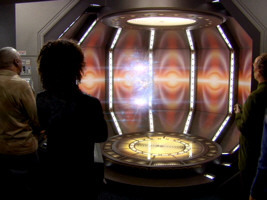 In 2266 they are seen aboard the Enterprise and other locations. 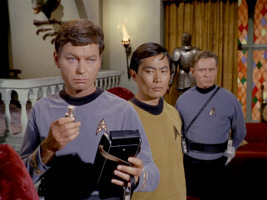 The data PADDs are often carried by yeomen (TOS: "The Man Trap", "The Menagerie, Part I", "The Menagerie, Part II"; DS9: "Trials and Tribble-ations"). Before the first appearance of the PADD in 2266, a clipboard is used in 2254 for the same task (TOS: "The Cage"). Some PADDs, like the one used by Dr. Lewis Zimmerman aboard Jupiter Station in 2376, are translucent. (VOY: "Life Line"). Universal translator in TOS: "Metamorphosis"
On Earth, the universal translator (UT) was invented shortly before 2151, and is still experimental at the time of the launch of the Enterprise NX-01, and very large compared to micro UTs in later centuries. Despite its being able to translate alien languages in relatively short order, due to the UT's experimental nature, the use of a skilled linguist – in Enterprise's case, Hoshi Sato – was still required (ENT: "Broken Bow"). By 2161, UTs appeared to be incorporated on uniforms and Hoshi Sato developed the Lingua Code Translation Matrix in her late 30s (ENT: "These Are The Voyages", "In a Mirror, Darkly"). Universal translators are used, but unseen with a few exceptions in the 2260s (TOS: "Metamorphosis"). Installed on NX Class starships in 2151 (ENT: "Broken Bow"). Dialog suggests that 22nd century starships that fought in the Earth-Romulan War were without viewscreens, or at least incapable of visual communications (TOS: "Balance of Terror"). Viewscreen technology was present on United Earth vessels, while the Romulans seemingly did not use them (ENT: "Marauder"). The NX Delta prototype used a window instead (ENT: "First Flight"), as did the Phoenix in 2063 ("Star Trek: First Contact"). In 2233 in the Abramsverse the Kelvin already has a window instead of a viewscreen, the Enterprise built later also uses a window ("Star Trek (2009)"). 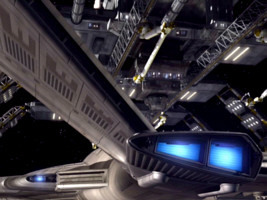 Transporters are new and just approved by Starfleet for biomatter transport by 2151 as shown in ENT: "Broken Bow." This is the earliest on- screen use. The first Human transporter was invented by Emory Erickson some time before 2121, with the first operable transporter being developed before 2139 (ENT: "Daedalus"). Moab IV colonists do not know of this tech. The colony was founded on the planet around 2168, based from statement "200 year old joke" (TNG: "The Masterpiece Society"). In TAS: "The Terratin Incident," the colonists who settled Terra 10 claimed to have had knowledge of transporter technologies two centuries before 2269 (this can mean anytime in the 21st century). In 2268, Montgomery Scott transports Tepo directly from his headquarters to those of Bela Okmyx. Not counting time travel, this is the first known use of this technology (TOS: "A Piece of the Action"). Site-to-site transport is not possible or not practical in 2151. After beaming it up from the surface, it is necessary to materialize the antimatter generator on the transporter platform first before it can be beamed out in space (ENT: "Civilization"). Protein resequencer in ENT: "Unexpected"
Food served on 22nd century starships is produced with protein re-sequencers, which have limited capabilities compared to later technologies and therefore require a chef as well (ENT: "Fight or Flight", "Oasis", "Dead Stop"). Replicator technology is, however, in use by the Assigners in the mid 2260s, and the Beta 5 computer utilizes replicator technology to manufacture several false identity cards for use by Gary Seven (TOS: "Assignment: Earth"). Starships of the 23rd century period are equipped with food synthesizers. This is a step forward, but does not achieve the quality and sophistication of the 24th century replicator (TOS: "The Naked Time", "The Trouble with Tribbles"). Replicator technology is not yet employed on starships as late as 2293 ("Star Trek: The Undiscovered Country", VOY: "Flashback"). Captain Jean-Luc Picard beams down to Delta Rana IV with a portable matter replicator for the Uxbridges in 2366 (TNG: "The Survivors"). 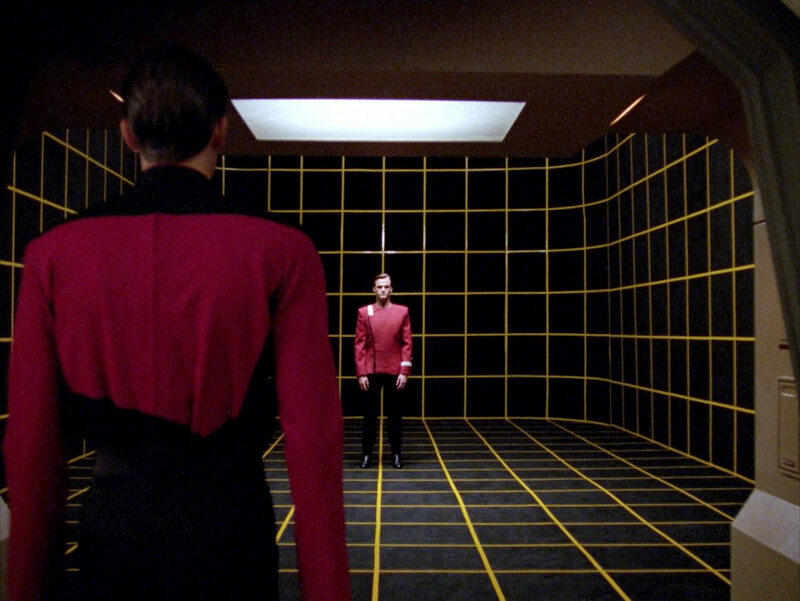 By 2364, the Federation Starfleet has begun installing holodecks aboard their vessels (TNG: "Encounter at Farpoint"). Prior to the late 24th century, Federation starships were not equipped with holodecks (VOY: "Flashback"). 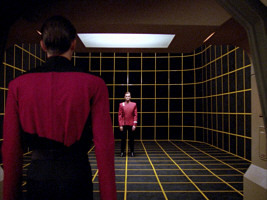 In the 23rd century, Constitution-class starships were equipped with a "Rec Room" which employed holographic technology similar but less advanced than shown in TNG (TAS: "The Practical Joker"). Trip remarks that a holographic simulation on a Xyrillian ship is more advanced than anything he'd seen on Earth (ENT: "Unexpected"). The Emergency Medical Holographic program (EMH) is a sophisticated hologram developed in the early 2370s by Starfleet and used on most Federation starships in the late 24th century. It is designed to provide short-term advanced assistance during emergencies in sickbay to the extent of literally replacing a starship's medical officer (DS9: "Doctor Bashir, I Presume"). In 2268, while testing the ill-fated M-5 multitronic unit aboard the USS Enterprise, Spock lamented to Dr. Leonard McCoy on the misfortune that computer programming had not yet advanced far enough to replace a starship's surgeon. McCoy retorted that he'd rather resign than be replaced (TOS: "The Ultimate Computer"). Starfleet commissioned the brilliant holo-programmer Doctor Lewis Zimmerman at the Jupiter Station Holoprogramming Center as the embodiment of modern medicine. The EMH Mark I was first activated in 2371, and was programmed with over 5 million possible treatments from the collective information of 2000 medical references (VOY: "Lifesigns"). Alternate phaser (2258 version) in "Star Trek (2009)"
Phasers are not seen before or during TOS "The Cage" set in 2254. In all later TOS episodes set around 2265 phasers are standard. In ENT: "These Are The Voyages", set in 2161, phase modulated particle weapons still exist instead of phasers. Worf says to Berlinghoff Rasmussen "There were no phasers in the 22nd century" who appeared to agree (TNG: "A Matter of Time"). In the "Star Trek (2009)" film, phasers are seen on the USS Kelvin in 2233. Phaser rifle in TOS: "Where No Man Has Gone Before"
Spock has to make a special request for a phaser rifle to be brought down to Delta Vega in 2265, no earlier use is seen on "The Cage" or ENT (TOS: "Where No Man Has Gone Before"). In 2259 of the "Star Trek" (2009), phaser rifles are issued to Starfleet security personnel on Earth after a terrorist bombing. 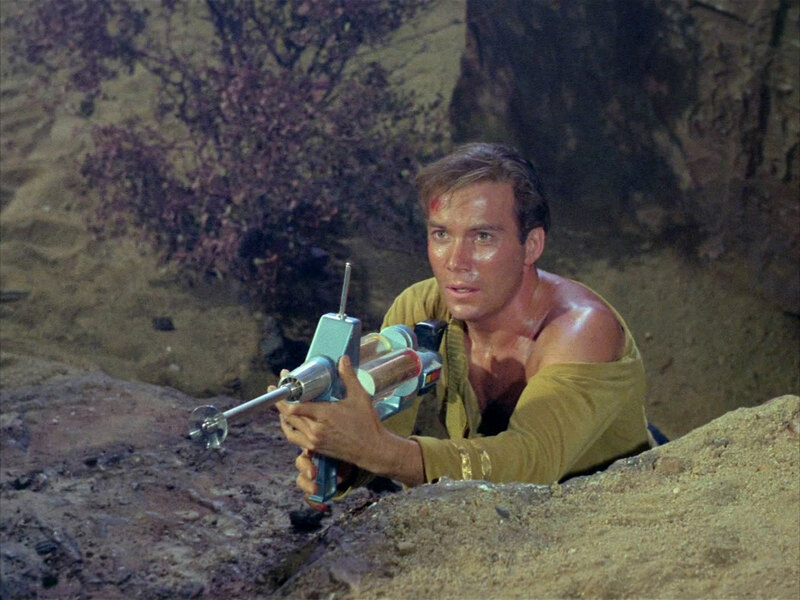 Alternate Kirk uses a phaser rifle to try to take out Alternate Khan's jumpship. When fired, this rifle only has a bright muzzle flash and recoil and does not appear to fire a visible phaser beam or a phaser burst ("Star Trek Into Darkness"). The phase pistol is introduced in 2151 for use by Starfleet personnel as a replacement to the EM-33 pistol (ENT: "Broken Bow"). They remain in use by 2161 (ENT: "These Are The Voyages"). 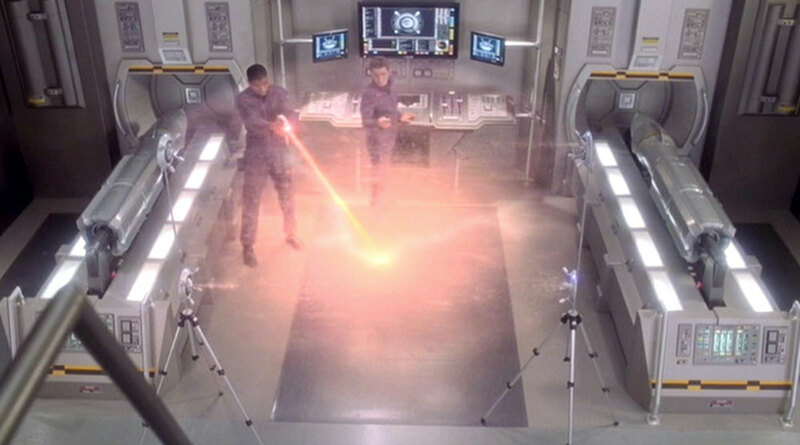 In 2063, albeit in the Mirror Universe, an unknown energy pulse weapon is used by Cochrane to shoot a Vulcan, it fired a pulse (ENT: "In a Mirror, Darkly"). Starfleet vessels, operated by the United Federation of Planets, begin using photon torpedoes by at least 2233 ("Star Trek 2009"). Earth's Starfleet in the 2150s still employ the spatial torpedo, although they soon upgrade to photonic torpedoes, the apparent precursors to the photon torpedo (ENT: "Fight or Flight", "Sleeping Dogs", "Judgment", "The Expanse", "Borderland"). Polarized hull plating is presumably invented by 2102, as that was the year the ECS Horizon was commissioned which featured the technology. The ship, referred to in many Enterprise episodes, is seen finally in 2153 (ENT: "Horizon"). The NX-01 Enterprise has hull polarization from its launch in 2151 (ENT: "Broken Bow"). Not used on NX-class ships in 2151 (ENT: "Broken Bow"). 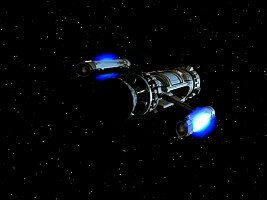 Used on Constitution-class ships in the 2260s (TOS: "Balance of Terror"), these ships were in use before 2254 (TAS: "Yesteryear", TOS: "The Cage"). Forcefield in ENT: "Vox Sola"
Starfleet began research on such a device in 2147, then referred to by Malcolm Reed as a "stable EM barrier." He makes use of such a barrier to save several crew members in 2151 (ENT: "Vox Sola"). 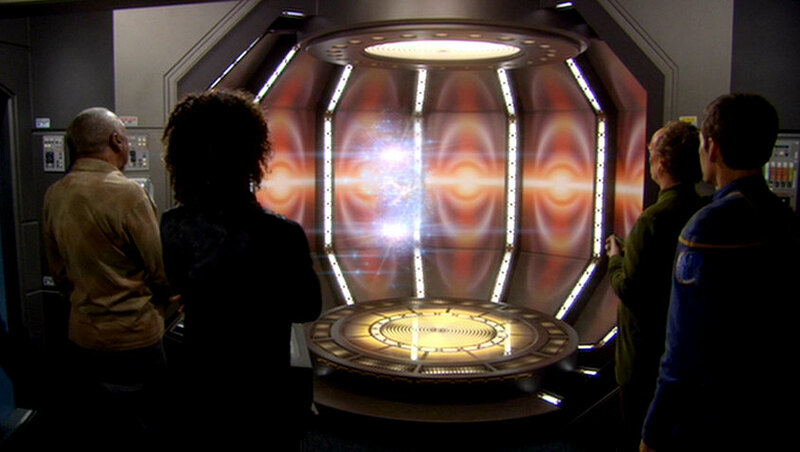 Holding cells on the USS Enterprise NCC-1701 are protected by forcefields (TOS). In 2293, when the USS Enterprise-B is struck by the Nexus energy ribbon, a structural integrity field was raised over the hole in the hull after Kirk is lost ("Star Trek: Generations"). At least two Federation penal colonies have forcefields to prevent escape in the 2260s, Elba II asylum and the Tantalus colony (TOS: "Whom Gods Destroy", "Dagger of the Mind"). During the late 2260s and early 2270s, a life support belt, a type of personal forcefield that supplies the wearer with the appropriate atmosphere and protects them from the vacuum of space, is used (TAS: "Beyond the Farthest Star", TAS: "The Slaver Weapon"). Never seen on Human ships, all episodes featuring a cloaked Federation or United Earth ship of any kind have alien technology for the effect. The sole exception is in 2358, as the captain of the USS Pegasus, Pressman, was placed in charge of testing an experimental phasing cloaking device, which had been developed by a secret group at Starfleet Security in direct violation of the Treaty of Algeron, which banned the use of cloaking technology aboard Federation starships, a mutiny followed amd the test failed (TNG: "The Pegasus"). Hypospray in TOS: "The City on the Edge of Forever"
A thoracic hypospray is used by Dr. Phlox in 2151; it is uncertain if this is a Denobulan or Human device (ENT: "Terra Nova"). 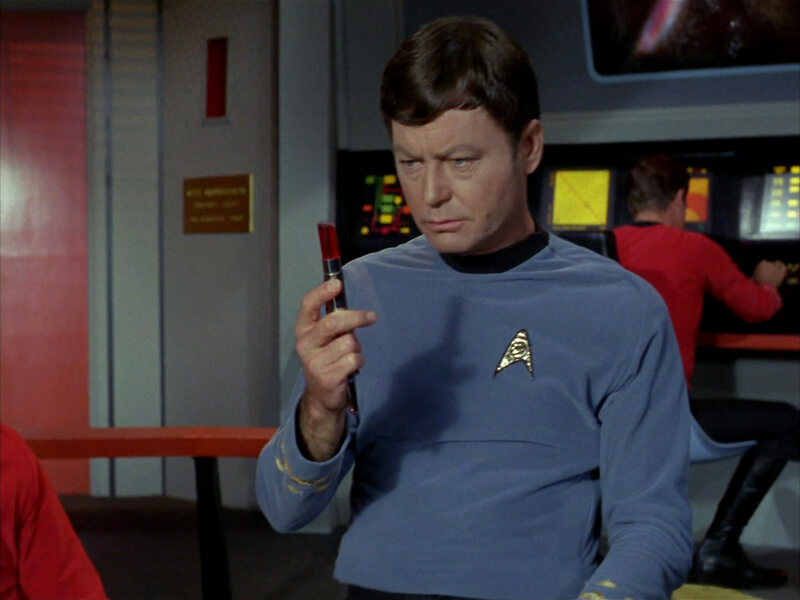 A "spray applicator" is a similar medical device standard in medkits during the 2270s ("Star Trek: The Motion Picture"). Hyposprays are used in 2265 (TOS: "Where No Man Has Gone Before"). 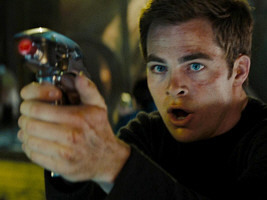 In the Abramsverse, hyposprays are used in the year 2258 ("Star Trek: 2009"). In the real world, so-called jet injectors (developed since 1960) are based on much the same principle as the hypospray. They are not seen in use in the 2150s, and many suitable cuts are not treated with dermal regenerators (ENT: "Broken Bow", "Terra Prime", et al). Captain Kirk wears a bandage after being stabbed, and Dr. McCoy warns Kirk of a risk of the wound bleeding if he's not careful. This suggests dermal regenerators are not around in the 2260s (TOS: "Journey to Babel"). They are in use by the 2360s (TNG: "Emergence", et al). Khan Noonien Singh in TOS: "Space Seed"
During Earth's 20th century, efforts to produce "superhumans" resulted in the Eugenics Wars of the 1990s. 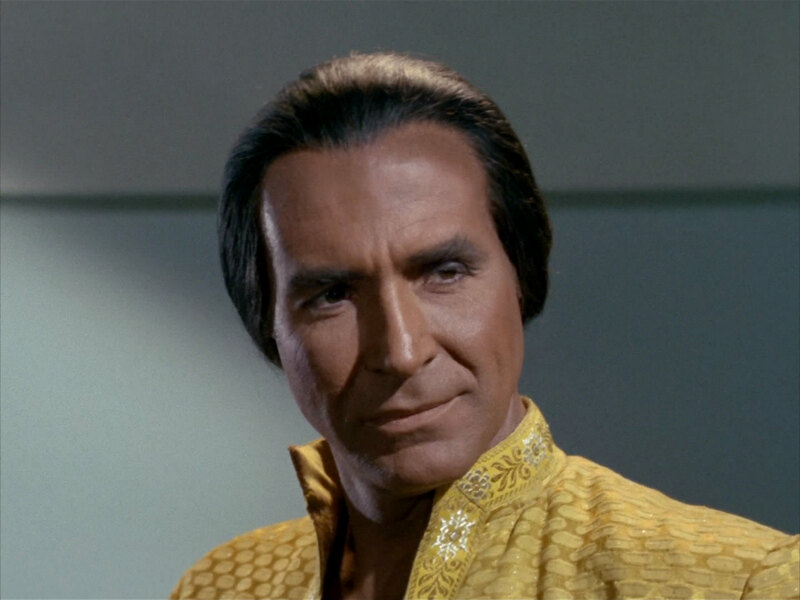 Genetically engineered individuals such as Khan Noonien Singh attempted to seize power (TOS: "Space Seed", "Star Trek: The Wrath of Khan"). The technology was banned "decades" before 2154 (ENT: "Affliction"). The Genome colony on Moab IV, which was established around 200 years before 2368, was a rare successful case of the technology being used (TNG: "The Masterpiece Society"). By the 24th century, the United Federation of Planets allowed limited use of genetic engineering to correct existing genetically related medical conditions. Persons known to be genetically enhanced, however, were not allowed to serve in Starfleet, and were banned from practicing medicine (TNG: "Genesis", DS9: "Doctor Bashir, I Presume"). In 2365, the Federation undertook genetic research on Humans at the Darwin Genetic Research Station. Their immune systems caused rapid aging in adults exposed to the children, killing the entire crew of the USS Lantree (TNG: "Unnatural Selection"). In 2377, the Doctor performs prenatal genetic modification on Miral Paris to correct a spinal deviation, a congenital defect that tends to run in Klingon families (VOY: "Lineage"). Clones in TNG: "Up the Long Ladder"
In 2155, the xenophobic Terra Prime group creates a binary clone of T'Pol and Charles Tucker III, in an attempt to "prove" that Humans and aliens should not associate. She is named Elizabeth, but she dies in her infancy due to flaws in the cloning process (ENT: "Demons", "Terra Prime"). The Mariposa colony was inhabited entirely by clones of the five original settlers. Since the colonists knew that two women and three men could not sustain a society, they looked to science to survive and turned to cloning. Future generations later referred to them as the "progenitors". 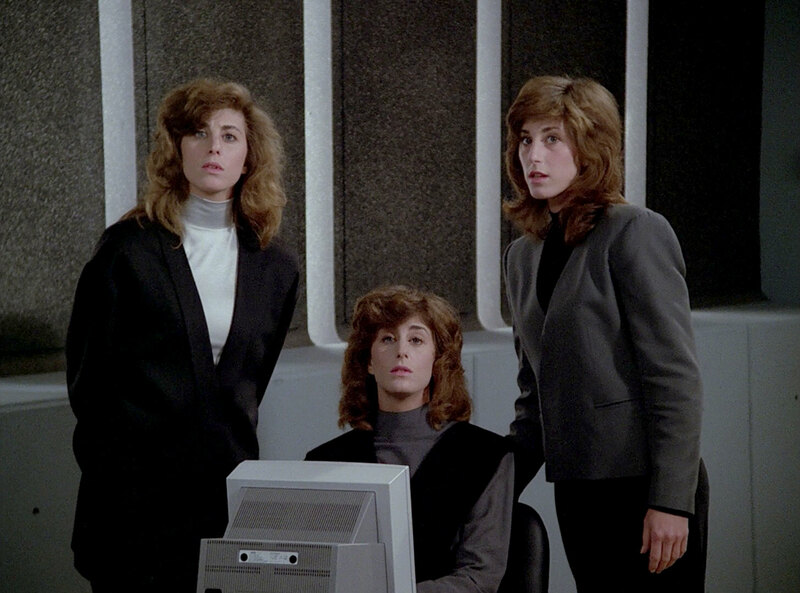 However, by the 24th century the colony's survival was threatened by their limited genetic diversity because of a phenomenon known as replicative fading (TNG: "Up the Long Ladder"). The Lyssarrian desert larva, when injected with DNA from another organism, is transformed into a mimetic symbiot which is identical to the original donor and also carries their memories. In 2153, Charles Tucker III has one such clone, Sim (ENT: "Similitude"). The beginning groundwork for the Soong-type android was first developed in 2154 by Noonian Soong's ancestor, Dr Arik Soong, after giving up his work in genetics (ENT: "The Augments"). Data was constructed on the planet Omicron Theta around 2336, after his brother, Lore, had been deactivated (TNG: "Datalore"). B-4 was a prototype android constructed by Doctor Noonian Soong on Omicron Theta in the 2330s. He was one of three failed prototypes before the construction of Lore was successful (TNG: "Inheritance", "Star Trek: Nemesis"). Mars simulation in VOY: "Lifesigns"
Conditions on Mars were sufficiently altered to allow Humans to survive on the surface by only having to use small breathing gear and thermal insulation in 2155 (ENT: "Demons"). Regula, a Class-D planetoid whose interior was terraformed as the second phase of Project Genesis ("Star Trek: The Wrath of Khan"). The Genesis Planet, created in 2285 from the Mutara Nebula, but destroyed as a result of the Genesis device, which contained protomatter ("Star Trek: The Wrath of Khan", "Star Trek: The Search for Spock"). Venus is the site of several terraforming stations by the 24th century (DS9: "Past Tense, Part I"). Caldos colony, established in the 22nd century, was terraformed (TNG: "Sub Rosa"). 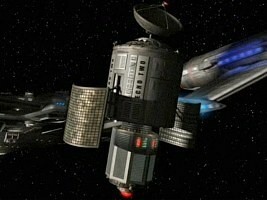 Epsilon 119, a dead star, is reignited with protomatter in the first phase of creating a new star system (DS9: "Second Sight"). The Moon looks a lot different in the 24th century compared to 2063, according to Will Riker there's even cities and lakes on the Moon, although the Moon looks identical on all TNG episodes at Earth and on the startup theme to the present ("Star Trek: First Contact"). Sonic showers are present aboard Federation starships at least as early as the 2270s. ("Star Trek: The Motion Picture"). Other Technology Inconsistencies - about structural integrity, inoculations, contending hardest substances, forgotten technologies etc.